The Skylark C unmanned aircraft system is intended for maritime operations. Image courtesy of Elbit Systems Ltd. The Skylark C UAV being launched using a catapult launcher from a small vessel. Image courtesy of Elbit Systems Ltd. The Skylark I mini UAS is the basis for the Skylark C maritime variant. Skylark C autonomous mini unmanned aircraft system (UAS) was unveiled in August 2016. 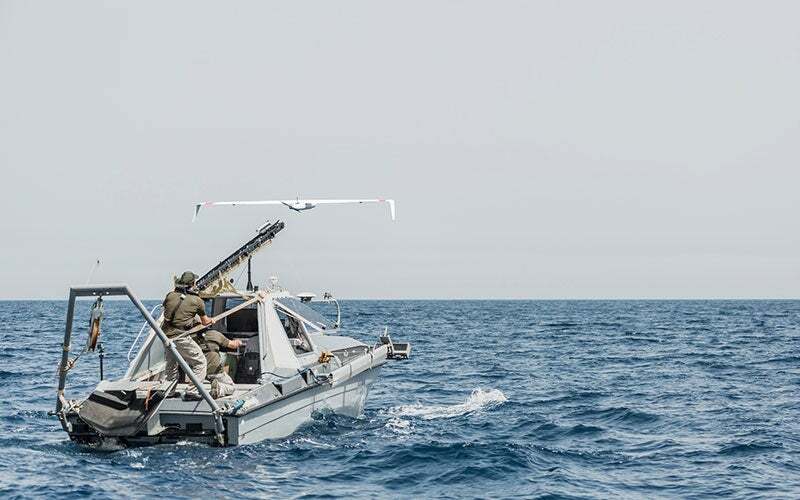 It is the latest variant of the Skylark family of UAS and is developed by Elbit Systems, an Israeli-based provider of defence and electronics-related products. Built for operation from small vessels, the new Skylark C mini drone provides naval forces with real-time tactical intelligence, surveillance, target acquisition, and reconnaissance (ISTAR) capability. The aerial vehicle’s low visual and acoustic signatures make it ideal for covert operations such as border security, coast guard, maritime situational awareness, anti-piracy, special naval operations, and anti-terrorism. The Skylark C aircraft system is based on the man-portable Skylark I mini UAS. It consists of unmanned aerial vehicle, launch and recovery equipment, sensors and control system. The aerial vehicle features a lightweight design with a water-resistant casing and has high-wing structure with downward pointing winglets. The Skylark C can be remotely controlled by a two-person crew from its launch platform or can fly autonomously from take-off to landing, allowing for easy operation. The Skylark C unmanned aerial vehicle (UAV) is launched from the top of the boat using a catapult launcher. A fully autonomous parachute recovery system enables the UAV to land and float safely on water surfaces. It can also be retrieved on the deck of the boat using a net recovery system. The time required for the entire process, from retrieval to relaunch to conduct another mission, is approximately 15 minutes. A nose-mounted, stabilised, electro-optical / infrared (EO / IR) payload system developed by Elbit Systems offers continuous surveillance and mission-critical information in all-weather, day and night conditions. It incorporates a colour daylight camera and high-resolution thermal imaging system for capturing high-quality imagery and videos of potential threats even in poor visibility conditions. The payload system also integrates various other sensors including automatic target tracking system, geo-registration, moving target indicator, communications, and a standard inertial navigation system (INS). The onboard INS provides inertial information and guidance for the drone during the flight. During operation, the Skylark C UAV sends high-resolution imagery and ISTAR data to a portable mission control system (MCS) via a secured, encrypted communication link. Operators at the control station store and analyse the sensor data and send back mission commands to the UAV through the data link. The drone can also be controlled using fly-by-camera technology. The Skylark C UAV’s electrical propulsion system provides quiet and efficient operation over an extended period of time. The drone’s manoeuvrability is further enhanced by a two-blade propeller located at the rear. The base variant has a maximum take-off weight of approximately 7kg and can transmit data to a distance of 40km. Elbit Systems’ Skylark family of unmanned air systems including Skylark I, Skylark II, Skylark I-LE and Skylark I-LEX are in service with the Israel Defence Forces, as well as a number of military and security forces worldwide. The company unveiled another new variant, designated Skylark 3 UAS, for land-based missions in February 2016. Seafury International's surface drives and surface piercing propellers have been in production for over twenty years, supplying law enforcement, surveillance, military, commercial and strike craft throughout the world.